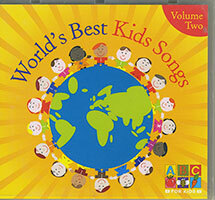 The World's Best Kids Songs Volume 2 follows on from the huge popularity of volume 1 with even more of the world's best songs for kids. Volume 2 again features favourite nursery rhymes, action songs, classic songs and favourites from movies such as Follow The Yellow Brick Road, Beauty And The Beast and Rainbow Connection. So if you loved the original The Worlds Best Kids Songs this is a must for your child.